Pirates' Andrew McCutchen has been seriously struggling at the plate as of late. What's causing his slump? Any time a player with Andrew McCutchen’s track record—three straight seasons with a .300/.400/.500 slash line and an NL MVP is pretty good, no?—the instinct is to remain calm and assume that all will eventually be well. That, indeed, was my instinct earlier this week when I recommended McCutchen as a player to buy in our Hitting Report. Now, I’m not backing off that completely. I’m still pursuing McCutchen, especially since you can almost certainly get him at a reduced price. After having some more time to look into his struggles, however, I’m now doing it with eyes wide open and an understanding that there is genuine reason for concern. The numbers tell an ugly, sad, puzzling story. In 26 games this season, McCutchen is hitting .210/.302/.320 with two homers, six total extra-base hits and one stolen base (we have to note that through 26 games, he was hitting just .188/.279/.292 with five extra-base hits and one unsuccessful stolen-base attempt). McCutchen suffered a left knee injury in the spring, and it appears that is at the root of his issues this season. The lack of steal attempts from a guy who has swiped at least 18 bags in each of his six seasons in the league practically screams something is wrong with his legs. Before we get to that, though, let’s go a little further with the numbers. McCutchen has a .229 BABIP and that seems, on its face, unlucky. Unfortunately for those who want to attribute McCutchen’s problems this year to the whims of the BABIP fairy, he’s earning that ghastly number. McCutchen’s line-drive rate is at 11.8% this year, which is something you’d see from a pitcher, not one of the best hitters in the league. His hard-hit percentage is 31.8%, while his career average is 36.9%—that’s actually not a bad rate for most players, but McCutchen isn’t most players. Pitcher scouting: Is Jacob deGrom becoming too predictable? Many people are focusing on these two different measures of how often McCutchen is hitting the ball on the screws, and that is a worthwhile exercise. But there's another stat that has me truly worried about McCutchen. While the star outfielder has always been adept at using all fields—what great hitter isn’t?—he has also been pull dominant, heading into this season with a pull percentage up near 45%. Pulling the ball is generally associated with big power numbers, and every single player has more power to his pull side. 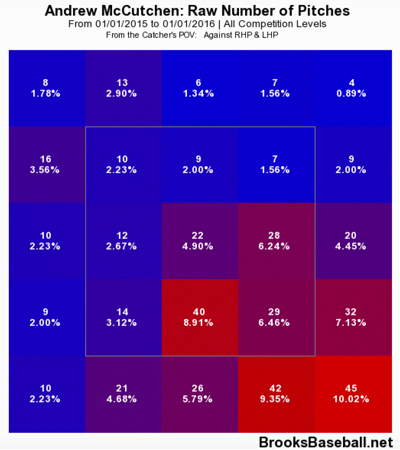 This year, McCutchen is pulling the ball just 40% of the time, and going to the opposite field 27.1% of the time. That suggests his timing is off, especially when taken in conjunction with his low line-drive and hard-hit rates. Poor timing, for a player of McCutchen’s stature over this long a stretch, could very well owe to an injury. First, let’s clear the obvious possibility out of the way. McCutchen is not getting pitched outside more often. The following zone profiles from Brooks Baseball show how McCutchen was pitched in 2012 through '14, compared with this year. 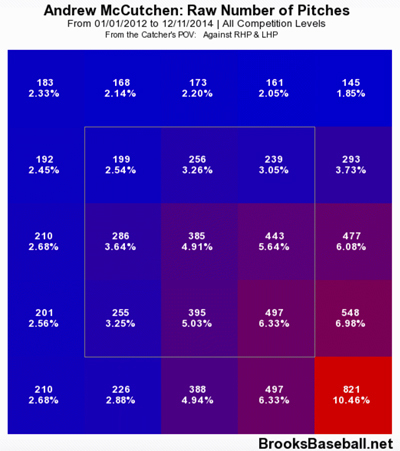 As you’ll see, he’s actually being pitched away a touch less often this year than he was in the prior three. After eliminating that possibility as the cause, I feel safe saying that McCutchen’s timing is off. It may not seem intuitive that an injured knee would throw off a hitter’s timing, but everything involved in a swing is connected. Yes, the hips are more important, especially for generating power, but the lower legs have their role to play. As you’ll see, McCutchen’s lower legs are actually rather important for his load mechanism. We’re going to look at a series of GIFs and screenshots, one each from 2013 through this year. First up is 2013. 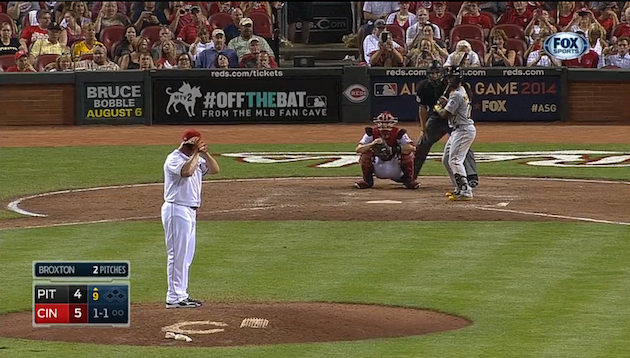 McCutchen actually set up a bit more open back then, but he has always had an open stance. Here’s what that looked like then. Now comes the important part. Watch this GIF, and pay particular attention to what McCutchen is doing between the time he takes his place in the box and the pitcher, in this case Travis Wood, goes into his motion. You see the way he rocks back and forth on his back leg, slowly flexing and relaxing his front knee? That’s a pretty loud lower half for any hitter, and remember it’s that front knee that is bothering McCtuchen. I purposely picked a pitch he didn’t do anything with to show that this is something that has been part of his rhythm at the plate for years on every pitch. Fast forward to 2014. 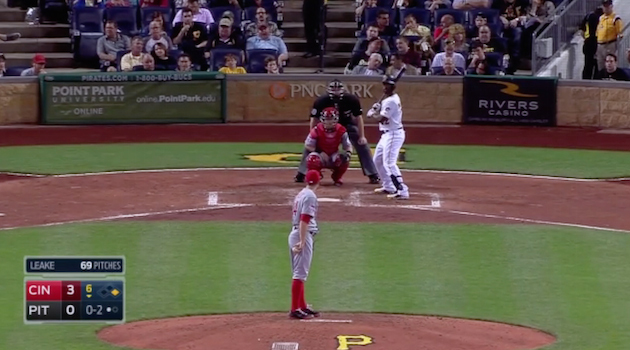 McCutchen has closed up his stance a bit, but he’s still open. Other than that slight tweak, everything is the same. 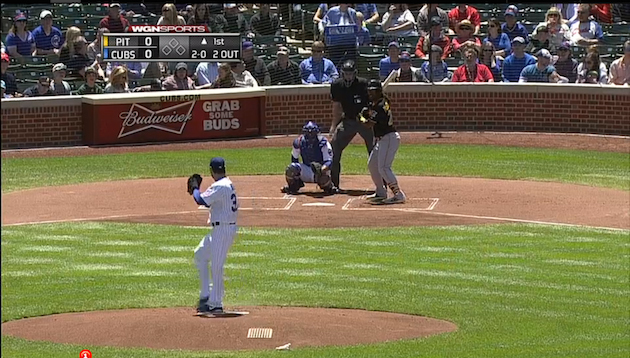 In this at-bat, McCutchen blasts a game-tying home run off Jonathan Broxton. Again, watch the way he rocks back and forth before coming still as the pitch is released. This is the moment that he loads his hands and gets his weight on his back foot. With this movement familiar, also note that while he starts opened up, he closes off his swing so his front and back feet are perfectly aligned. Let’s take a look at this one in the slow-motion replay to really get a feel for how McCutchen used that lower-half sway to load his swing. Notice how he doesn’t take much of a stride with the front leg, but pivots on that foot nearly as much as he does his back foot. A high school coach would probably cringe at those mechanics, but McCutchen his ridden them to an MVP award and the top of the league. Now we turn our attention to this season. The following is from Wednesday, a game in which McCutchen went 1-for-4 with a single and three groundouts. This is the last one of those, a weakly hit ball to Joey Votto. First, the setup. Nothing different here. Slightly open stance, stiff back leg, hands in the same spot, everything is normal. The video tells a different story. McCutchen still has that same loud lower half as he waits for the pitch to be delivered, but he doesn’t get nearly the same torque on this swing. His front foot doesn’t pivot at all, and he actually takes such a stride that he ends up a bit closed on the swing. That is not Andrew McCutchen. It’s an impostor wearing his jersey. McCutchen’s swing has always started at his legs, with the almost imperceptible sway actually playing a large role in the way he times the release of the pitch. Throw that off by a mere fraction, and everything goes awry. That could very well explain why he’s barreling up fewer balls and hitting the ball to the opposite field more often than ever, and it all comes back to that left knee injury suffered during the spring. I still believe he’s worth pursuing in a trade because I believe he will eventually get through what is ailing him. Make no mistake, however. McCutchen’s struggles haven’t been happenstance and bad luck. With his timing at the plate off, he just isn’t the same guy who has become one of the very best players in baseball.